This private, secluded and romantic vacation rental home at the pinnacle of Reed's Island, has three comfortable private bedrooms with baths. Surrounded with large windows opening into the lush tropical rain forest setting. The kitchen pavilion with windows on all sides surveying, as from a crow's nest, the two gorges, towering palms and waterfalls. 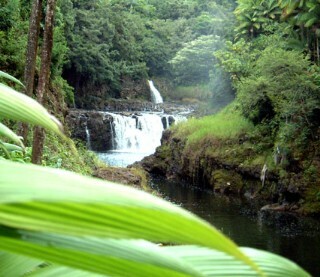 A magnificent location with its own private waterfall on the Wailuku River, Hilo's finest vacation rental property.